It's designed for use by companies that make wearable computers, home automation equipment, and automobiles, as a common platform they can use to build additional services for their customers. A big benefit of SAMI, according to Julia, is that it will be able to collect and store data from any device in its original format. Samsung will "normalize" the data and make it available as a feed—he called it a firehose, using the Twitter metaphor—that can be consumed by other applications. Julia was director of Apple's Siri project for about ten months until he left Apple last year. It's easy to see similarities between the projects: Both collect data from a variety of services and deliver them through a single app. But while Siri is specific to Apple, Samsung wants its platform to be used by many companies. Julia didn't give a lot of technical details but said Samsung wants it to be as "open" as possible, and it's not interested in defining standards. Samsung is working with about 50 partners to develop and test SAMI, he said. 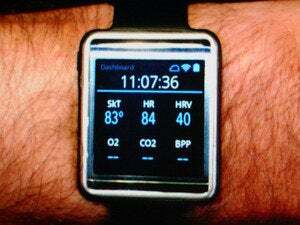 They include Fitbit, smartwatch maker Pebble, Withings, which made the scales, and Vital Connect, which made the heart monitor. The Menlo Park lab also has a $100 million, three-year fund to invest in companies developing technologies that could support the effort, he said.